Born in Hong Kong and educated in England, Jewellery Designer/maker Melissa spent her early years travelling to and from Asia. Her love of the exotic and a passion for beautiful things led to travels where she began to collect stones and gems; turquoise and amber from Tibet; garnets in Pakistan; antique agates in China; coral and shells in the Philippines. Naturally creative, Melissa began to make jewellery combining the elements she had collected with pearls, silver and gold. She was following in the footsteps of her aunt, internationally acclaimed jewellery designer Kai-Yin Lo whose innovative and original style had always been an inspiration. Her love of diversity, colour and cultural expression led on to an MA in Social Anthropology although she continued to create and give workshops in jewellery making. Inspired by nature, organic forms and colour, Melissa personally designs and hand makes pieces including a bespoke service and a collection of one off pieces. Melissa Lo Jewellery can be described as strikingly individual yet classically elegant. Each piece is individually designed and hand crafted using the finest quality semi-precious stones and freshwater pearls finished with silver and gold. Melissa’s unique style creates a collection of diverse, colourful and desirable pieces. Her signature is her ability to combine colours and forms in an original and appealing way. Melissa believes this creates jewellery that enhances the natural beauty of the stones and lifts the spirits of the person wearing it. 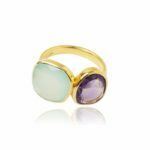 Melissa Lo Jewellery is made with the finest hand picked semi-precious stones and freshwater pearls. Please note that the stones are natural and there may be slight differences in colour between the photos and the product. There is no nickel in any of the jewellery. All the pieces are silver 925 or silver 925 with 18K gold plating. Gold vermeil is a term used for a type of gold plating. To care for your Jewellery keep it in a cool dry place, ideally in a soft pouch and always put your jewellery on last after having applied any lotions, sprays and perfumes.